Yesterday, I was in the French Riviera. How crazy that I can actually say things like that?! We headed out really early in the morning (and I was a complete zombie) with a guided program of international students. (It’s really interesting to see how different Americans are perceived by those who try to speak French and those who just refuse to stop speaking English. I’m finding it more and more important to constantly stay in French.) The drive was only 45 minutes to the very famous seaside resort town (and birthplace of Brigitte Bardot). 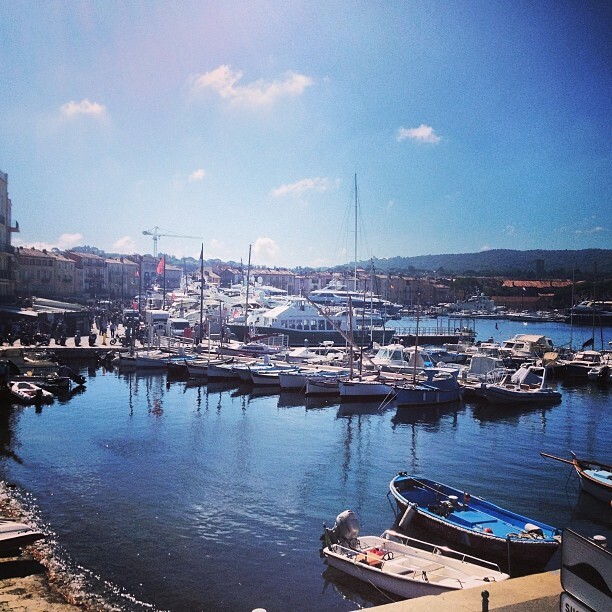 We arrived in Saint-Tropez, walked around a little, and then went to the MASSIVE outdoor market (marché). There was so much crammed into one space; cheese stands, fruit and vegetables, meat, seafood, clothes, shoes, jewelry, linens, wine. It was intense. We bought our picnics there (water, bread, and brie- simple and delicious) and I bought a fouta, which is a thin Mediterranean linen towel/tablecloth. It just perfectly captured the breezy, sunshine atmosphere. We walked around the port and checked out all the big, beautiful boats. I didn’t really understand the term “yacht people” before now. The luxury was hard to handle. Afterword we got back onto the bus and headed to a little town twenty minutes away. Most students took off on a hike but we went down to the beach and enjoyed our picnic on the rocks. Swimming was a bit of a struggle because the rocks and algae made it intense to get out far enough but in between all the rocks near the shore was a perfectly clear pool where we sat among little silver fish. It was a very happy, sun-soaked afternoon.